Each block is made up of four (4) pieces which were 1 1/2 inch square.. the finished block is 3 inches small. This was such a fun quilt to make, and I used a lot of my little white on white scraps as well as my precious Lizzy House bits. 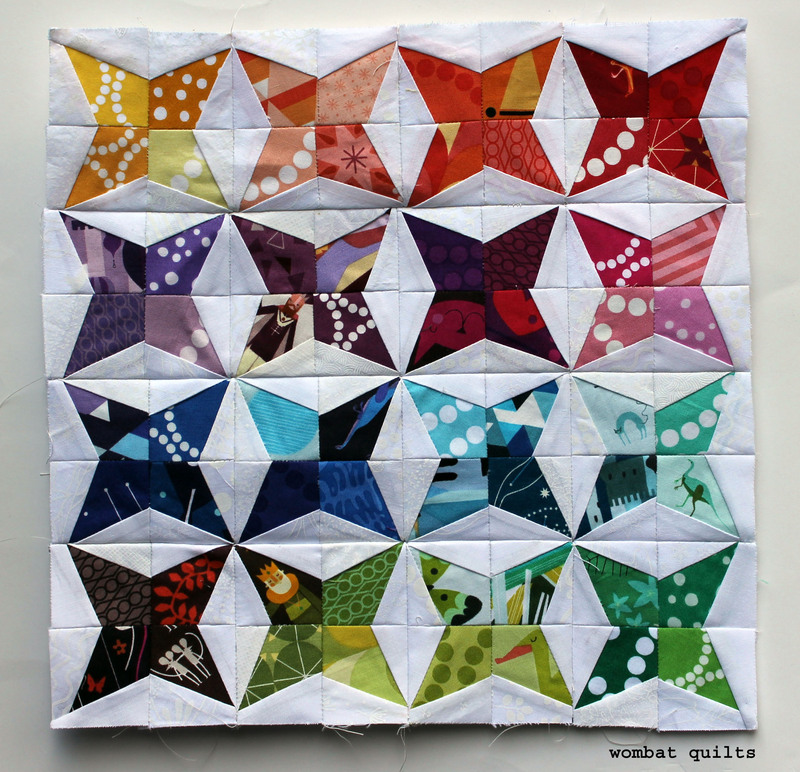 If you are interested in making your own kaleidoscope mini quilt you can find the free paper piecing pattern here….WQ mini Kaleidoscope block. 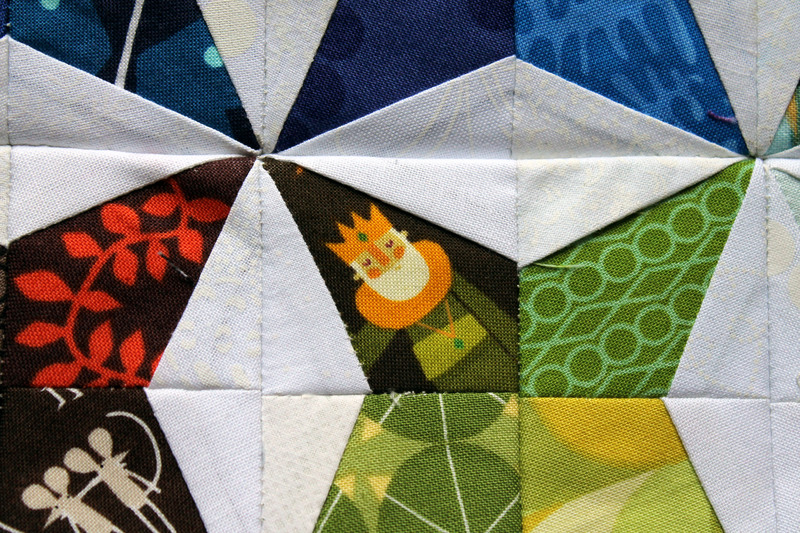 I have signed up for one more mini quilt swap, so I warn you there will be some more paper pieced little quilts shortly. « A personal project done…. you have the most beautiful fabrics!! Thank you for all the free patterns!! 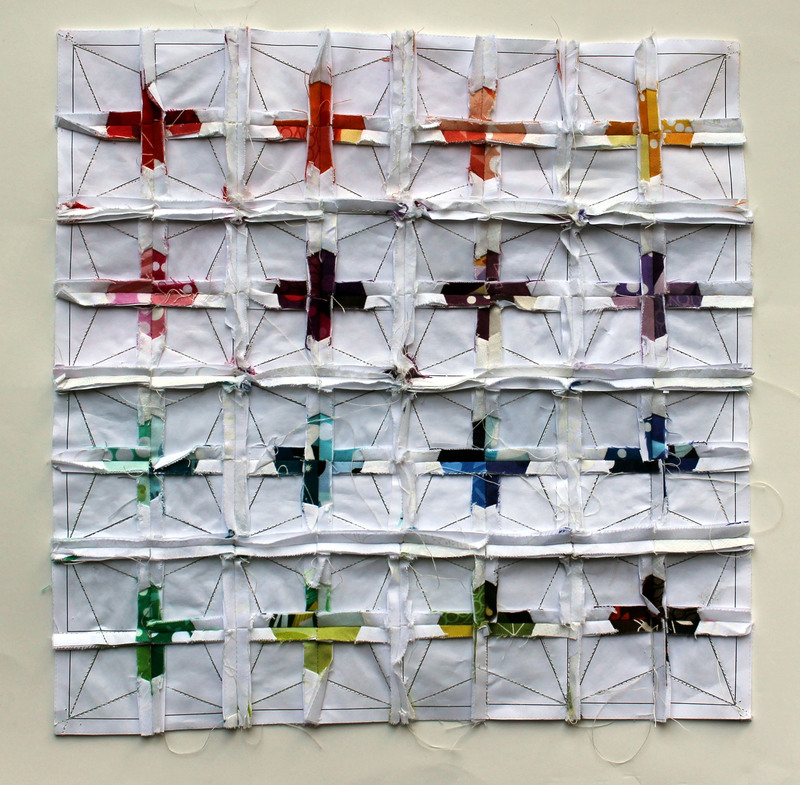 Wow….thanks so much for this little beauty of a quilt and pattern!!! I need to give it a try!!! This seems to be the year of the Mini – I’ve seen so many, but this is by far the cutest! Thank you for the template. A great way to use up scraps! Fabulous cuteness! You’ve done such a great job on the fussy cutting, and the whole thing is gorgeous. I’ll be using that block at some stage, I bet! It could, but as I’m *much* less skilled than Cath at paper piecing, I’ll leave it for someone else to play with! How great would it be, though…. Very, very satisfying to look at – and an impressive work – tiny is so delightful!! Hej, That’s such a cute pattern. I think this would be perfect for the next pillow swap. Thanks for the idea and the pattern. Wonderful! And how funny with the paper in it its back side looks like a plus-quilt. I had not thought about the back…but you are so right. It does look like a cross quilt. Miniatures are such fun! And this one is especially attractive. This is so cute! Love the color gradation you did! Fussy cutting and colour washing all from scraps? I am impressed. Amazingly small! Such a perfect design for those little pieces…Gorgeous! Oh wow, that is sooooo tiny! I love the colours. You sure make a small amount of fabric accomplish great things. When first seeing the top, you really don’t realize how tiny it actually is. I love those fussy cut pieces. This is such a cute mini – the design is perfect and I love all of the fussy cut prints! You are so awesome for sharing your patterns, thank you! Really pretty little quilt. When you paper piece, do you always make the seams larger and press them open? When do you remove the paper? Thanks! Marti I always iron the seams open and use a standard 1/4inch seam. I only remove the paper when all the blocks are sewn together. There is too much wiggle and stretch otherwise.